Are the days and weeks flying by for you, too? Do you find it difficult to believe that it's March already? Tick, tick, tick. Time passes. Dull days have given way to a few with more sunshine. When I wander around the garden, I see more and more signs of life. It's so uplifting. The daffodil bulbs planted last spring are spiky stalks with a few buds and one open flower. Pointed red ovals of peonies thrust upwards toward the sun. Lilac, blueberry, raspberry, and more show the promise of life. I mentioned making yogurt last week and a couple of readers asked for my recipe. It's not complicated, but I did a little research into why the process is as it is. Many recipes call for the milk to be heated to 175-180 degrees (Fahrenheit), then cooled to 110-120 F before adding the yogurt culture. I wondered why the heating was necessary because the milk is pasteurized. If you Google the question, you'll get lots of answers, some more scientific than others. Basically, though, 180 degrees is hotter than pasteurization, and the heating alters the proteins in the milk to enable the yogurt to become thick. I'm certainly no expert as I've just begun making it, but it's worked so far! Heat the milk (I do 3-4 quarts at a time) in a heavy pot over medium heat until 175-180 degrees (Fahrenheit). I run a sink full of cold water and set the pot into the water and let it cool to 115 degrees or so. In a small bowl or cup, mix 1/4 cup plain yogurt (I use organic) with a 1/4 cup of the cooled milk. Whisk well. Add the yogurt mixture to the rest of the milk and stir. Pour into clean jars. Screw on the lids. I set my jars into my electric oven, turn on the pilot light, and go to bed. In 7-8 hours the yogurt is done and ready to chill. You can leave it to culture longer for a tangier flavour. I've left mine up to 12 hours. It tastes best if allowed to chill before eating. A couple of weeks ago I mentioned a short boating trip to take the boat to the marine shop. On Saturday we did the reverse trip. This long pier, seen from the water, caught my attention. Tulips are adding colour to the house these days. I do love pink flowers, particularly in the spring when I get tired of the grey weather. Soon there will be lots of colour outside; I can hardly wait. What an uplifting set of colourful images Lorrie and thank you for the yogurt recipe, I will give it a try. Love the photo of the pier - it is fascinating. Lovely pictures and thanks for the yoghurt recipe as although I have made it in the past I have lost my recipe and wanted to try making it again both because it would not need plastic pots as the bought stuff and also since we have been snowed in here and apprently the supermarket shelves were bared due to difficulties with deliveries. Although now the thaw has begun and transport is esier so supplies will be delivered again but it would be good to know how to be more self sufficient. I did make bread during the time we couldn't get out which for us wasn't that long. Spring flowers are showing again now as the snow melts and all is looking much better. Looking forward to the days when a stroll in the yard is possible. 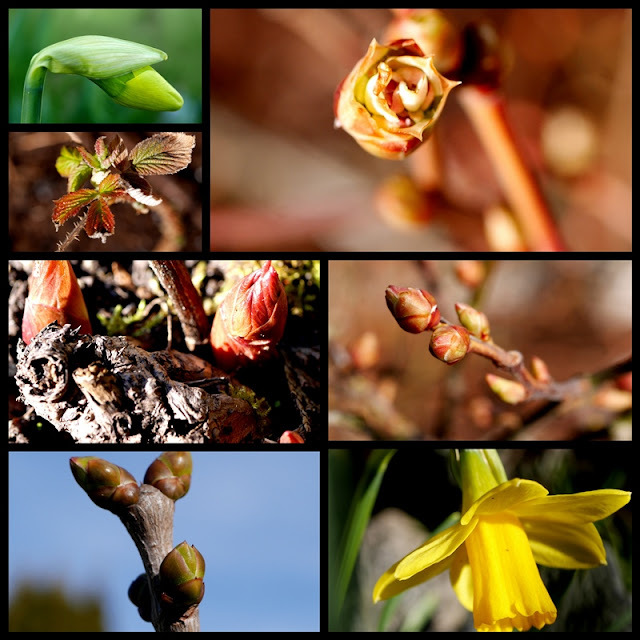 Your garden photos are making me eager for spring and summer! Peonies! I have bulbs coming up, and in typical March fashion we are cold this week. The sky is blue though, and the sun shining today. Spring is on the way! The pier picture and stunning reflection is an amazing photo, competition worthy. Spring flowers are a favourite of mine so a joy to see those beautiful tulips. I love tulips so much, those are gorgeous. Enjoy! We're definitely seeing signs of colour in the garden and the mornings are becoming lighter. We need flowers this week. I think I'll buy tulips. Enjoy the week! I'm waiting for my tulips to bloom, they aren't far from it. I can't remember what colour they are! Beautiful photo of the long pier. As months whizz by so quickly we won't have to wait too long for warm weather and bright colours. Happy Monday! I love every single thing in this post! 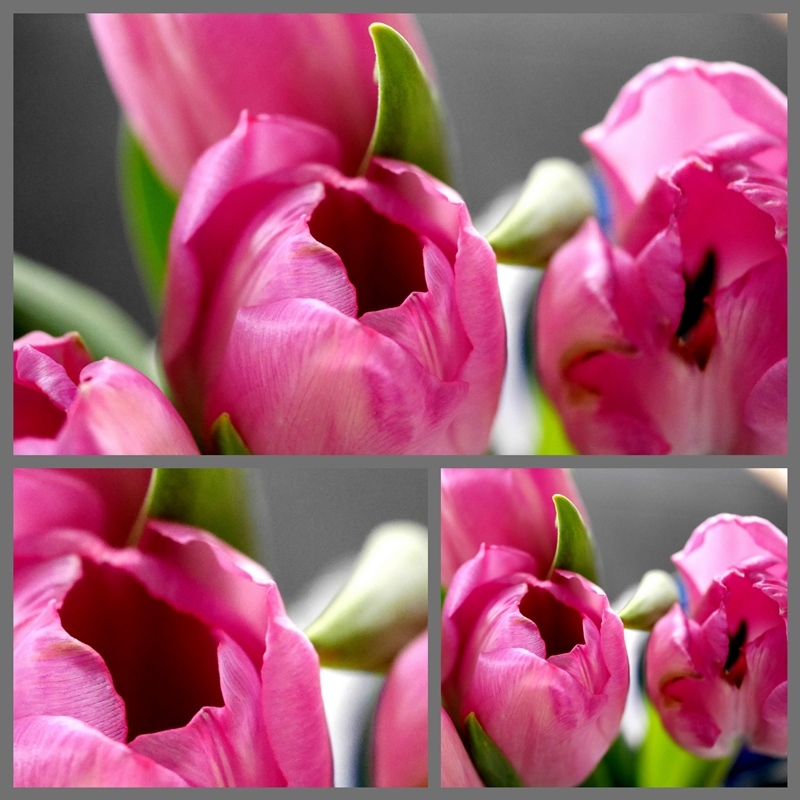 The pink tulips are stunning (and everybody already know my "woes" about not seeing real spring flowers ... and I have absolutely no right to complain I know... so I only do it in blogland.) Thanks for the memories (although the ones we grew in Oregon were never as beautiful as yours! Love the photo of the pier, absolutely amazing! Enjoy the new awakenings in your garden, spring is just around the corner for you. That is a great vantage point for the pier shot! Nice blooms showing their pretty faces in your gardens. Nothing up here just yet, but the spring birds have returned. Beautiful pic's, as always. I think I need some tulips over here! Love the pier reflection! Beautiful spring blooms -- daffs and tulips. I think everyone is ready for spring. I love yogurt, but have never tried making it. Thanks for the instructions. Happy Monday! Love the photo of the pier and it's reflection. Getting excited about the tulip festival again this year. The winter seems to drag on forever here so I've been enjoying the colourful flowers that you've been sharing. It's hard to believe that we're now just weeks away from spring! What a beautiful pier with a wonderful reflection! Love your pretty tulips too. We don't have all of the Spring flowers here in Florida but we have Amaryllis popping up in flower beds right now. That still amazes me. Enjoy your week! Hugs! Outside color soon . . . but in the meantime, those beautiful pink tulips are a sight for sore eyes! I ♥ tulips! The pier is very beautiful and you have perfectly captured that reflection. love to see new lives come out in your garden and your pink tulips are pretty! Ahhhh! Spring and color sings to my soul. Lovely to see your garden coming alive and pink tulips are definitely a delight. I really need to get back to making my own yogurt. The pier picture is quite lovely. Thanks! Love the pier photo! I'm wondering with the yoghurt recipe - when you say to add yogurt to the milk is that a yoghurt like you would buy ready to eat from the store? So then when you make your own you would keep some of that aside for the next batch? Well, buds and green growing things ... I can scarcely imagine since we still have over three feet of snow on the ground here. So, I feel blessed that I have so many blogging buddies that can share their pictures with me!! Your tulips are a true pick-me-up - superb choice of color! Have a wonderful week! The weather has been crazy; spring one day and winter the next day. Our poor plants are very confused. Some of our daffodils are in full bloom already. I like pink flowers too. I find them very soothing. The pier photo is beautiful. Have a nice week Lorrie. The tulips look so pretty. I am always surprised that your garden seems to be a little ahead of ours here in Colorado waking up in the spring. Your yogurt looks so good. I made yogurt when we had access to fresh cow's milk then the cows moved to Nebraska. I made it in my slow cooker. You have challenged me to try it again. I love tulips and the ones in your photographs are so lovely. Love the reflections in the pier photograph. Lorrie, I am happy to be feeling better and have been out a bit with the camera. I love the pink tulips! Sylvia D.
What a beautiful post, Lorrie! Thank you for your comment. I must dash now, my mother is not well. It does seem that the months fly by, Lorrie! I do see some signs of spring here, but we can get snow until May so I try not to get too excited about spring until then. We had our oldest granddaughter as our guest all week, as her parents were away, and she kept me busy planting apple seeds form her apples and an avocado pit from one I ate at lunch...lol I hope they all grow for her! Your lovely tulip photos are so cheering! I used to make yogurt in a large, wide-necked thermos jar, first heating the milk and letting it cool to blood heat. It was always successful. Your post reminds me to return to the habit and cut down on the current weekly large plastic pot. Such a gorgeous photo of the pier with the reflection. I love this time of year, with plants poking thru the soil. Nice to see a little color in the landscape. The yogurt looks delicious!